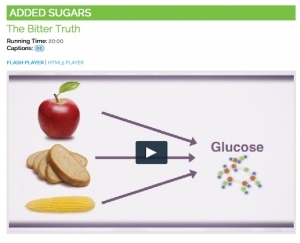 Have you missed our chats about sweeteners? It’s been a while since we last covered this hot topic, but that changes today. We’ve covered this strategy before, but it bears repeating. Fruit does contain sugar, but they’re sugars that are part of its natural nutrient package. With whole fruit, you get lots of vitamins, minerals, and dietary fiber along with that sugar. With 100% fruit juice, you get everything but the fiber. I like to chill or freeze fresh fruit, then drop a few pieces into a glass of sparkling water to add just a hint of sweetness. It’s also fun to find a 100% fruit juice that would compliment a flavor of iced tea and top my glass with a splash of juice. Freezing cubes of watermelon and pouring seltzer over them. Adding peeled slices of oranges to ice water in the fridge. Topping mint iced tea with a splash of peach juice. Pouring a bit of apple cider into hot cinnamon tea. There are certain spices that add a warm and sweet flavor to any beverage. 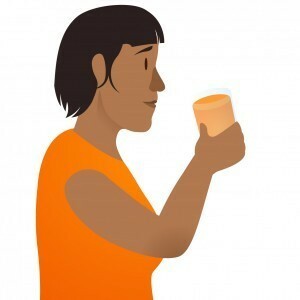 We’ve all seen the flavoring craze that swept along the use of pumpkin pie spice, but the bones of what makes that trend special can be inspiring for a wide range of other drinks. 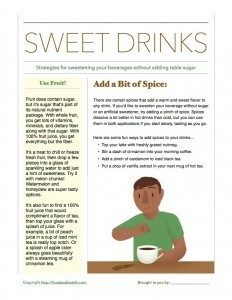 If you’d like to sweeten your beverage without sugar or an artificial sweetener, try adding a pinch of spice. Spices dissolve a bit better in hot drinks than cold, but you can use them in both applications if you start slowly and taste as you go. Top your latte with a bit of freshly grated nutmeg instead of sugar. 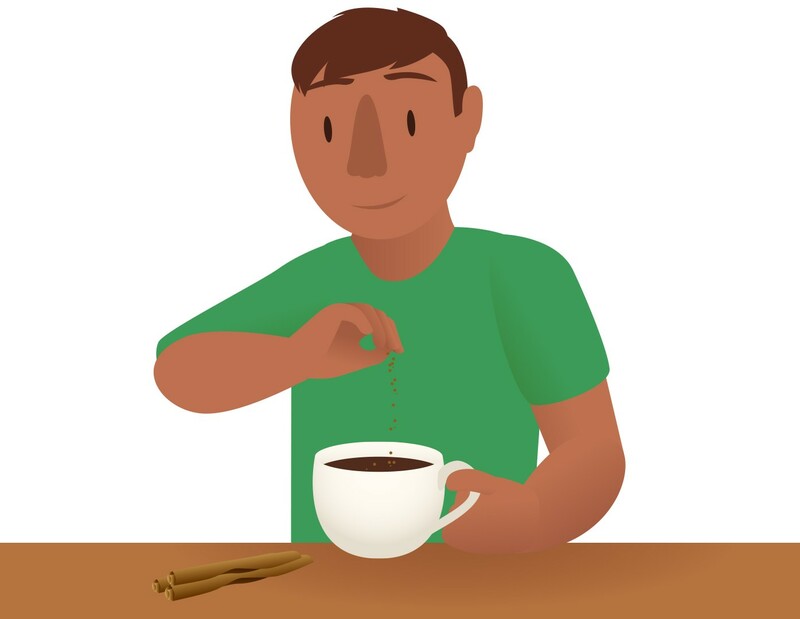 Stir a dash of cinnamon into your morning coffee. Add a pinch of cardamom to iced black tea. Put a drop of vanilla extract in your next mug of hot tea. Yes, milk! It’s surprisingly sweet, and that’s in large part thanks to the naturally-occurring sugars that are included in its nutrient package. Milk is a great source of calcium, one of the nutrients of concern that, according to the Dietary Guidelines for Americans, most people don’t eat enough of every day. Choose a low-fat or nonfat milk in order to get the most nutrients with the least amount of saturated fat, which can be bad for your heart. A splash can sweeten a cup of espresso. Making a cafe au lait (half coffee, half milk) in the morning is a great way to start the day. 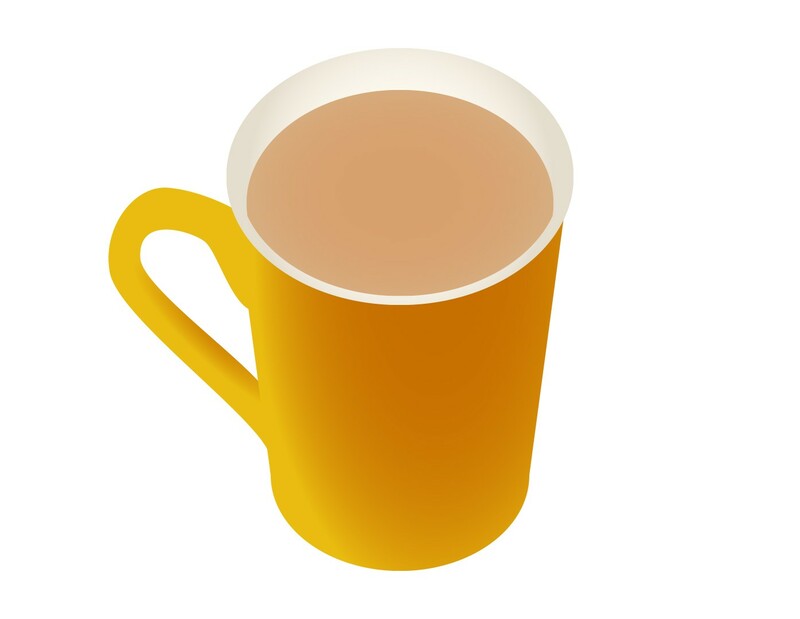 Taking English breakfast tea with a bit of milk can soften its bite. Sometimes the best way to sweeten your drink is with a traditional sweetener -- just make sure that you do it mindfully and in moderation. 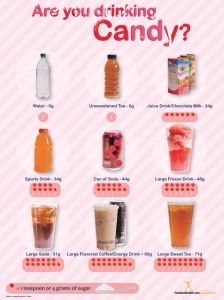 There are also ways to sweeten drinks without all the empty calories that accompany sugar. For example, natural sweeteners like honey and maple syrup contain more nutrients than table sugar, though they still don’t have a lot. Artificial sweeteners can have fewer calories, and calorie-free sweeteners — well, you get the idea. 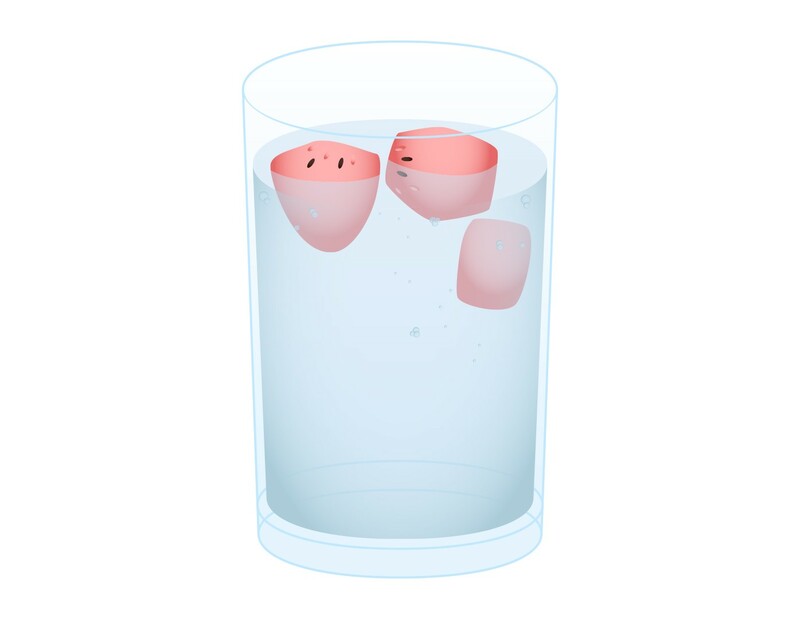 To sweeten cold drinks, I’ve found that agave dissolves quite well and adds a nice, subtly sweet flavor. Making a simple syrup is also a fun way to sweeten cold drinks. As a bonus, simple syrups use a 1:1 ratio of water to sugar, so you can dilute that sugar a bit and see if you can use less. You can also cook fruit or spices into your simple syrup to offer layers of flavor. To sweeten hot drinks, I find that regular old sugar dissolves well. Coconut sugar also adds a toasty kick of caramel, while honey and tea have gone hand in hand for as long as I can remember. I hope you’ve enjoyed this rundown of ways to sweeten drinks. What are some of your favorite strategies? Oh! I almost forgot! Here’s a handout with a few top sweetening tips. Get your free copy today! 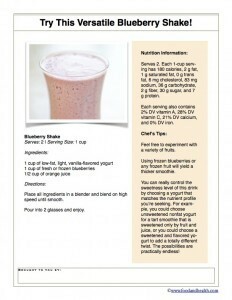 Speaking of handouts, have you seen the member-exclusive sweet smoothie recipe? It’s infinitely customizable and perfect for a cooking demonstration. Since sweeteners and drinks are such hot topics, I regularly find educational materials on the subject simply flying off the shelves. 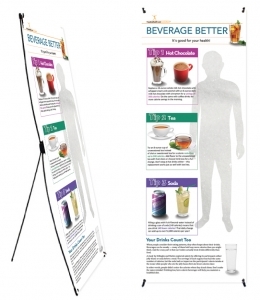 Get these great resources from the Nutrition Education Store before they’re gone!